Ever since the Space Shuttle program ended Nasa has depended on the Russian space program to launch astronauts to the International Space Station. Sierra Nevada is one of the companies competing to take the Space Shuttle’s place as Nasa’s ride into orbit. Unlike the SpaceX Dragon or the Boeing CST-100, Sierra Nevada’s Dream Chaser won’t be a capsule. It’s more like the Space Shuttle - a space plan that glides back to Earth. Dream Chaser test vehicle on the runway at Nasa's Armstrong Flight Research Center. BioServe Space Technologies is part of the University of Colorado Boulder’s Aerospace Engineering and Sciences Department. The scientists at BioServe conduct microgravity life science research, teach graduate-level courses on topics in microgravity, and supervise both undergraduate and graduate students pursuing careers in microgravity research. The Space Shuttle, the Mir space station, and the International Space Station have all hosted BioServe research projects. Under the agreement it signed with Sierra Nevada, BioServe will look into ways the Dream Chaser could host life science research in space. Why is this important for K12 education? BioServe has a history of developing space-based research projects for schools. Earlier this year BioServe sent a space ant farm to the International Space Station. OK, technically it’s BioServe’s Commercial Generic Bioprocessing Apparatus Science Insert. But it holds a colony of ants… in space. ISS astronauts activated the space ant farm in early January. They released the ants from the farm’s nest area into two forage areas where the insects could search for food. You can read a full description of the experiment design on Nasa’s mission page. Students will repeat the experiment with ant farms in their classrooms and compare the way ants behave on the ground to videos and photos of the space ants. Baylor University’s BioEd Online hosts the videos and developed classroom materials so any teacher anywhere can bring space research into the classroom. Spiders in Space lets students study the way spiders weave webs to the webs. Silicate Gardens in Space lets students study crystal growth. Students can compare the videos and photos that astronauts take of the experiments in orbit to the results of their own experiments in the classroom. With BiosServe’s long history supporting space science education, the agreement it signed with Sierra Nevada may lead to even more opportunities for teachers around the world to bring hands-on space research into the classroom. Before Nasa, before Sputnik, before Apollo, Walt Disney and Werher von Braun teamed up to show how humans would explore space. Jump to the 7:14 mark to see how that original vision matches the Dream Chaser. Of course, a lot of things have to go right between now and then. Not least is Nasa’s on-going struggle with Congress to fund the Commercial Crew Program. On top of that, Sierra Nevada is the third place team behind SpaceX and Boeing in Nasa's competition. But Dream Chaser’s chances may be stronger than they appear. The Dragon and CST-100 are both successors to the old Apollo-era capsules while Dream Chaser is the successor to the Space Shuttle and is much closer to Wernher von Braun’s original vision of human spaceflight. If Dream Chaser hangs on, then BioServe’s agreement could dramatically expand the number of classroom space research projects. That hands-on experience conducting science experiment, combined with the glamour of space, will reinforce students’ interest in science and math and prepare them for stem-related careers. Do you like amateur space exploration and want to support Small Steps to Space? 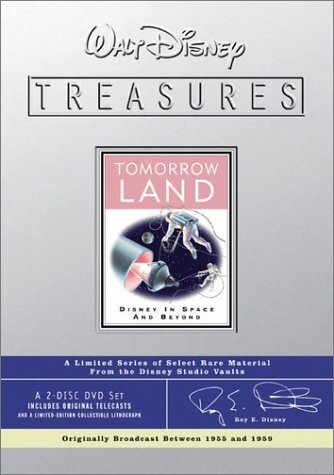 Buy the 2-DVD set of Walt Disney's "science factual" shows about the promise of space and science using the link to the right. Before you buy, watch part of the "Man in Space" series on YouTube.